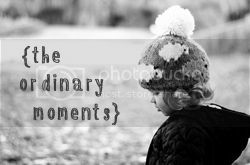 This 'ordinary moment' is no longer that ordinary! As a parent your time is dedicated to your baby/child so 'me time' is a rare occurrence. Yesterday I had a 'mummy afternoon off' and went for lunch and to the cinema with a friend. It does feel strange not having Eliot with me, no pushchair to push, no nappy to change, no wonderful cuddles. But it was nice not having to worry about getting down to the tube on escalators/stairs, struggling. Not many people help in London! It was great being able to fully concentrate on an adult conversation with my friend Kim. We had a good old catch up over lunch at Nandos before heading to the cinema. I was content knowing Eliot was having precious 'daddy time' with the OH. I received no calls or texts so felt happy all was well. I had an enjoyable afternoon and was thoroughly looking forward to cuddles with my boy. He was not as excited at me arriving home and was more interested in the toy he was playing with. Cue disappointed mummy! But I guess there will be moments as he gets older where he will want mummy cuddles and plenty of others when he is too busy or embarrassed.